Søren Philip Sørensen from Handelsflådens Velfærdsråd (standing right) was in Esbjerg to hand over the awards to the prize winning ESVAGT vessels. ESVAGT took home all the prizes in two of the categories – the ’Esvagt Don’, ’Esvagt Caroline’ and ’Esvagt Dee’ came 1st, 2nd and 3rd respectively in the running competition, and in the rowing competition, the ’Esvagt Stavanger’, ’Esvagt Caroline’ and ’Esvagt Cobra’ followed suit with 1st, 2nd and 3rd respectively. ESVAGT made room for other shipping companies in tramp shipping, where the ‘Esvagt Charlie’ pulled home a 2nd place. 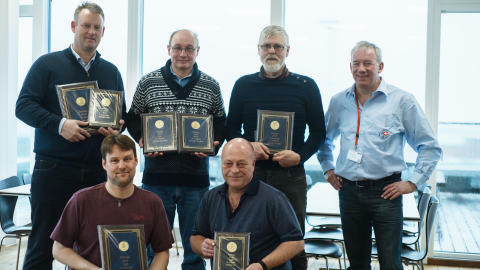 Each vessel received a plaque and a year’s subscription to the active training exercise magazine, Aktiv Træning. Why do we do it? We asked the crew on three vessels. 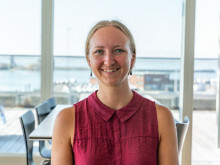 “I hadn’t done very much exercise before joining ESVAGT nine years ago but there were facilities on board and I needed to get moving. After a couple of years, I started using the facilities and as time went by, more and more people joined in. Two thirds of the crew now use the gym regularly. I run and cycle; others row or lift weights. It’s good that strength training has become more important for people because it is something that we can use to attract young crew members with”. “There isn’t a great deal of room for exercising on the small group C vessels but we do have rowing machines, a treadmill, weights, an exercise bike and a boxing ball. And people use them. Some like weights whereas others prefer to row or box. I cycle 60 kilometres every day – even in bad weather, which is no excuse not to get moving, but you do have to hold onto the bike a bit tighter when it’s stormy! We all have our aches and pains and getting some exercise really helps. And of course we do it for the sake of our health”. “I start my morning at 5:30 with a cup of coffee and a good chat with the cook and the boatswain about how to solve the world’s problems. If we are on normal standby, I will be on the treadmill at 6:30 and try to run 22½ km before my watch starts. I take a shorter run after work at a steady pace on the treadmill if the weather and my mood allow. I like to watch football or breakfast television while I am running. Unfortunately I have a sweet tooth, so it’s a good way to burn the calories off again! I think I have become addicted to the treadmill. The crew certainly seems to be very helpful when something seems to go wrong with it! When I am home, I run about 10-15 km every other day and do two marathons a year – having those to train for helps keep me motivated”.